Great find, Allison! Looking at the use of technology in the classroom from the perspective of Bloom’s taxonomy makes total sense. I downloaded the pdf you linked to and I am going to dig more into that document in the future, so thanks for sharing. Question: What were some of the best uses of technology in school that you saw during your internship? The school I interned at, Kenaston School and Distance Learning Centre, offers many online courses to distance students and to students wishing to take special electives (i.e. cow/calf course). This is very important for rural area, or home-schooled students who don’t have certain courses offered at their school (electives, calculus, and other low enrollment courses). Some courses were online correspondence courses, while other courses were broadcast live to students in other schools. The SMARTboard was integral to this because the students could hear the audio of the teachers voice, ask questions, and respond. Students could also see a live screencast of what the teacher was writing on the SMARTboard, over top of the notes. This was quite amazing to me, as I hadn’t seen anything like it before and is a great use of the technology we have. I like your 3 Cs. Without communication there is no collaboration and without creation, what do you have to communicate about? The creative element is always the most intriguing thing to me as well – I find I can’t connect to my learning without this, and I definitely appreciate choices on what creation looks like. Great post, Allison. I’m going to share the link to Bloom’s Digital Taxonomy in the shared resources of the class blog. I personally like the pyramid! Thanks for the visuals! Anyone reading: take a look. I love Bloom’s Taxonomy, and I particularly like seeing it’s concepts being applied to something contemporary like the digital world. With the rubrics and examples, that is a very useful pdf. I’m stealing it right now for use in future classrooms. Thanks for the link! 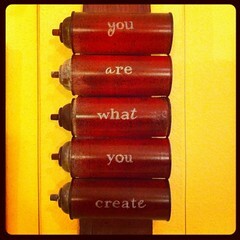 This is an awesome post, Allison! 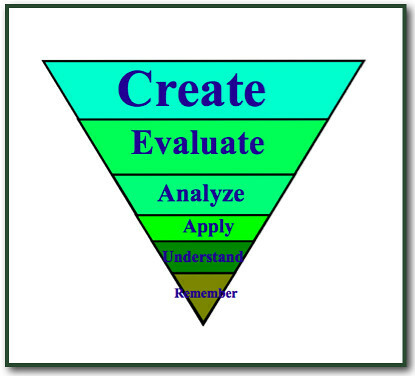 Bloom’s Taxonomy is important to educators, but I agree that it may be a little outdated. This resource is fantastic! It’s great to see a new and modern spin on these theories. I also have many creative projects to do this semester and I definitely prefer them to papers (I’m definitely not an English major)! Keep up the good work! Great blog Allison very informational – your creativity shines through!